at your favorite digital store! I am much better at picking names than titles. Finding a good title feels like catching smoke. I hear you... It was a brain-twister to come up with the name for my Nephilim Quest -series, and the first book in particular (Shadowhunter). Second one (Moon Daughter) just popped into my head. And the third one was easy - Amarna, as it happens there. Join in and write your own page! It's easy to do. How? Simply click here to return to Blog - coming up with names. 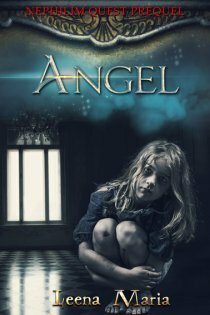 The first book you get for free is the Prequel to Nephilim Quest: Angel. Over two hundred years before Nephilim Quest 1 / Shadowhunter the roots of the story are planted. This book is not for sale anywhere - only readers who have subscribed to my mailing list will get it. ebooks, printbooks, even signed copies. CLICK HERE to see my Patreon page or the button below to become a patron. Or if you wish to buy me a cup of coffee, you can do so at my Ko-Fi blog page.